I am a home educating mom of three young children and a good planner is a necessity in order to stay organized with all of our daily events, classes, field trips and running our household. I have discovered that without the structure that is provided within a planner, I become frustrated and have even missed appointments. 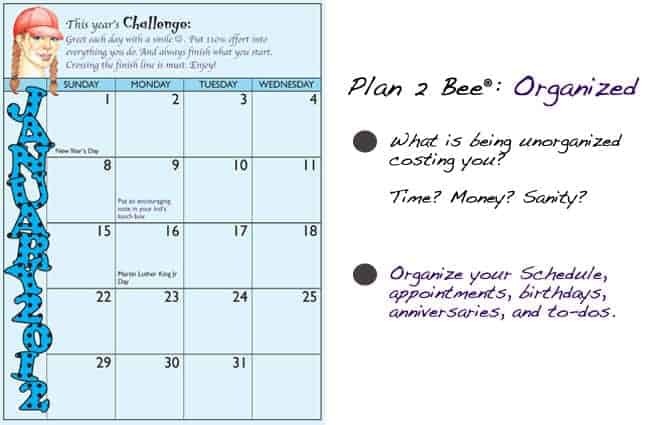 The Plan 2 Bee Planner is an all inclusive planner that is perfect for busy women and I love that it puts the focus on motivating, encouraging and inspiring ourselves instead of everyone else which is all too easy to do. I also like the way that this planner is designed as it includes a 12 month calendar and daily and weekly planning pages. My favorite feature is that it has lots of room to write in the spaces provided unlike other planners that I have used in the past. There are “Priorities” pages and monthly pages where you can schedule important special occasions, events or appointments. Since I am trying to lose all of those stubborn post-partum pounds, I really appreciate the inclusion of the Fitness/Nutrition log where I can track calories, supplements and fitness accomplished on a daily basis. It helps to keep me motivated and on track because I don’t like to see blanks in my log! The Plan 2 Bee Planner has really interesting original illustrations and the 262 full color pages are spiral bound so it is easy to turn from page to page. It is a great gift idea for the holidays and I suggest picking one up for you too. The creator of this planner, Lisa Casler is passionate about encouraging women to “live life with enthusiasm” and I think she has done a great job with this planner because it is easy to use, functional and has lots of little extras that make it a pleasure instead of a chore. You are invited to visit the Plan 2 Bee website to purchase your 2012 copy of this planner for only $19.99!